Pipe organ in Église Saint-Thomas, Strasbourg, France. In music, an organ is a keyboard instrument which makes sound by forcing air through pipes. They are common instruments in churches, and sometimes appear in theatres, especially older movie theatres or cinemas. A person who plays the organ is called an organist. South corp in the Duomo di Milano. The history of this large organ (now with about 16,000 pipes) began in 1395, and it was continuously remodeled until 1986. The present decoration is from the 16th century. 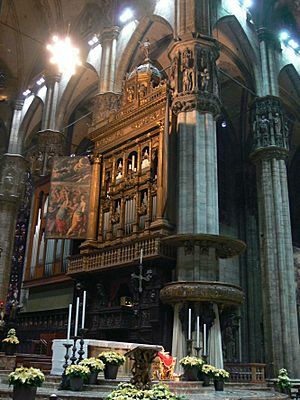 The pipe organ is the grandest musical instrument in size and scope, and has existed in its current form since the 14th century (though other designs, such as the hydraulic organ, were already used in Antiquity). Along with the clock, it was considered one of the most complex human-made creations before the Industrial Revolution. Pipe organs range in size from a single short keyboard to huge instruments with over 10,000 pipes. 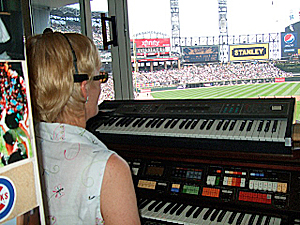 A large modern organ typically has three or four keyboards (manuals) with five octaves (61 notes) each, and a two-and-a-half octave (32-note) pedalboard. 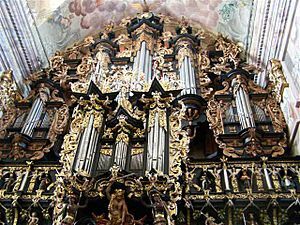 Baroque Leżajsk organ by Stanisław Studziński and Jan Głowiński, accomplished in 1693, has mechanical controls (tracker system) and 75 voices altogether. It consists in fact of three separate instruments, this is why three organists can play simultaneously. The principal purpose of most organs in North America, South America, Europe, Australia and New Zealand is to play in Christian and Reform Jewish religious services. An organ used for this purpose is generally called a church organ. The introduction of church organs is traditionally attributed to Pope Vitalian in the 7th century. Due to its ability to simultaneously provide a musical foundation below the vocal register, support in the vocal register, and increased brightness above the vocal register, the organ is ideally suited to accompany human voices, whether a congregation, a choir or a cantor or soloist. Most services also include solo organ repertoire for independent performance rather than by way of accompaniment, often as a prelude at the beginning the service and a postlude at the conclusion of the service. 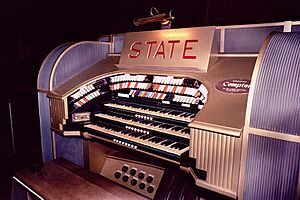 A chamber organ is a small pipe organ, often with only one manual, and sometimes without separate pedal pipes that is placed in a small room, that this diminutive organ can fill with sound. It is often confined to chamber organ repertoire, as often the organs have too little voice capabilities to rival the grand pipe organs in the performance of the classics. The sound and touch are unique to the instrument, sounding nothing like a large organ with few stops drawn out, but rather much more intimate. They are usually tracker instruments, although the modern builders are often building electropneumatic chamber organs. The theatre organ or cinema organ was designed to accompany silent movies. Like a symphonic organ, it is made to replace an orchestra. However, it includes many more gadgets, such as percussion and special effects, to provide a more complete array of options to the theatre organist. Theatre organs tend not to take nearly as much space as standard organs, relying on extension and higher wind pressures to produce a greater variety of tone and larger volume of sound from fewer pipes. 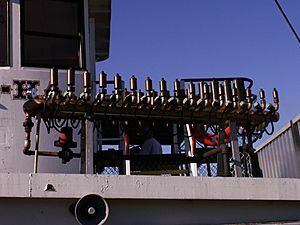 This extension is called "unification", meaning that instead of one pipe for each key at all pitches, the higher octaves of pitch (and in some cases, lower octaves) are achieved by merely adding 12 pipes (one octave) to the top and/or bottom of a given division. 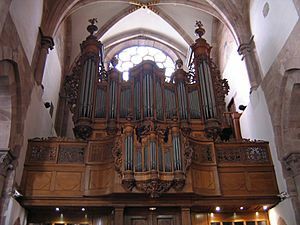 Assuming there are sixty-one keys on an organ manual (a common number in concert organs and in North America), a classical organ will have, for diapason stops at 8', 4' and 2' pitch, a total of 183 pipes (61 plus 61 plus 61). The same chorus of diapasons on a theatre organ will have only 85 pipes (61 plus 12 plus 12). Some ranks, such as the Tibia Clausa, with up to 97 pipes, allow the organist to draw stops at 16', 8', 4', 2', and mutations from a single rank of pipes. The bamboo organ called Bambuso sonoro is an experimental custom-made instrument designed by Hans van Koolwijk. The instrument has 100 flutes made of bamboo. The reed organ and harmonium was the other main type of organ before the development of electronic organs. It generated its sounds using reeds similar to those of a piano accordion. Smaller, cheaper and more portable than the corresponding pipe instrument, these were widely used in smaller churches and in private homes, but their volume and tonal range was extremely limited, and they were generally limited to one or two manuals, pedalboards being extremely rare. 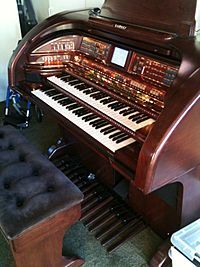 The chord organ was invented by Laurens Hammond in 1950. It provided chord buttons for the left hand, similar to an accordion. Other reed organ manufacturers have also produced chord organs. Hammond B3 organ, and Leslie speaker cabinet. The Hammond organ was the first successful electric organ, released in the 1930s. It used mechanical, rotating tonewheels to produce the sound waveforms. Its system of drawbars allowed for setting volumes for specific sounds, and it provided vibrato-like effects. The drawbars allow the player to choose volume levels of 0-8 for each of the members of the harmonic series starting from 16'. 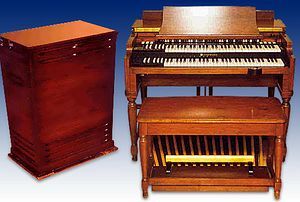 The three most popular models of Hammond organs were the consoles: the B-3, C-3, and A-100. 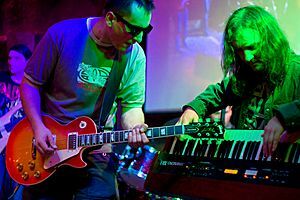 Inside all three models, the tone generators, drawbars, and keyboards were identical. The B-3 cabinet stood on 4 legs, the C-3 was an enclosed "church" model, and the A100 series had built in amplifiers and speakers. Though originally produced to replace organs in the church, the Hammond organ, especially the model B-3, became popular in jazz, particularly soul jazz, and in gospel music. Since these were the roots of rock and roll, the Hammond organ became a part of the rock and roll sound. It was widely used in rock and popular music during the 1960s and 1970s by bands like The Doors, Pink Floyd, Procol Harum, Santana and Deep Purple. Its popularity resurged in pop music around 2000, in part due to the availability of clonewheel organs that were light enough for one person to carry. 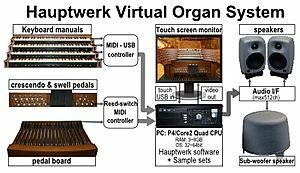 Virtual Pipe Organs, played via MIDI, access samples of real pipe organs stored on a computer, as opposed to digital organs that use DSP and processor hardware inside a console to produce sounds or deliver sound samples. With Stereo or mulitple channel audio systems, virual organs can approach the acoustic realism of a real pipe organ. For example, for most Virtual Organs with a pedal division containing 16 ft or 32 ft pipes, a subwoofer arrangement is required to reproduce the powerful movement of air at frequencies around 32 Hz or lower. For personal purpose, typically small studio quality near-field monitors with subwoofer are used. The wind can also be created by using pressurized steam instead of air. 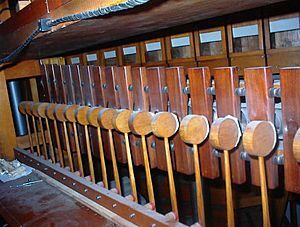 The steam organ, or calliope, was invented in the United States in 19th century. Calliopes usually have very loud and clean sound. Calliopes are used as outdoors instruments, and many have been built on wheeled platforms. Organ (music) Facts for Kids. Kiddle Encyclopedia.